Description: A Tier II pusher prepares to clear the crossing and reveal a Union Pacific SD70M. Title: BNSF 5795 DPU on an empty Scherer coal train. Description: BNSF 5795 waits to go, with an NS filler, on this only non coal drag we saw this day! Description: NS 735 heading back for more black diamonds. Title: BNSF 5795 Leads a coal load back north. Description: Running with no center headlight. Title: BNSF 5795 Is seen making its way thur Northeast Mo. Description: This sb coal load is seen stretched out coming down the k line. 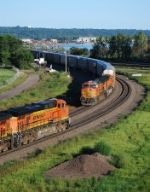 Title: BNSF 5795 Swings the Mp 81 curve. Description: Heading Sb on Easter Sunday with a loaded coal drag. Description: A pair of CSX prime movers and a pair of BNSF motors head north up the passing siding. Description: San Timoteo Canyon Road. EB UP Yuma Sub. Beaumont Hill. Description: BNSF 5795, 6614, 7447 and 5045 heading up the pass. Description: The cab door opens and the first crew member exits. Description: With his luggage in hand, the first crew member gets ready to detrain. Description: The first crew member detrains.